A C-602 being fired in China from a land-based launch vehicle. Is Pakistan now producing Chinese anti-ship missiles under license? The Pakistan Navy has recently test-fired a shore-based anti-ship missile (AShM) named “Zarb.” Inter Services Public Relations (ISPR) did not offer any specific information, such as range, speed, or payload weight. Pakistan had issued a navigational warning notice several days in advance of the test. The maximum range allotted for the test was set at 300km, which was compliant with the Missile Technology Control Regime (MTCR), an international legal framework that regulates commercial missile and drone sales on the global arms market. The Zarb was inducted to enhance Pakistan’s area denial capabilities by equipping its coastal areas with AShM-tipped launch batteries, which in turn could fire AShMs at intruding surface ships up to a maximum range of 300km. Upon concluding the test, the Navy announced that it had formally inducted the Zarb AShM. With no prior tests registered over the Arabian Sea, and the fact that it is MTCR-compliant, it is likely that the Zarb is an off-the-shelf purchase. That said, the specific characteristics of the Zarb AShM are unknown. Given the fact that it was tested from a coastal battery, it is plausible to suggest that the Zarb is basically the C-602. 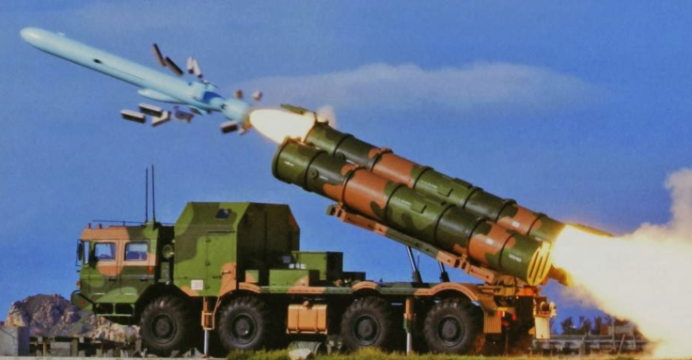 Produced by China Aerospace Science and Industry Corporation (CASIC), the C-602 is a heavy AShM capable of delivering a 300kg warhead. A heavier variant (with a 480kg warhead) is also available in the form of the CM-602G. The idea of Pakistan acquiring the C-602 is not a surprise, but the use of a local name (i.e. Zarb) suggests that the missile is being produced domestically. Given the added cost of such a technology transfer (i.e. to produce the missile domestically), would it not make more sense for Pakistan to acquire the C-802 instead? At this time, the C-602 can only be used from Pakistan’s coasts, there are no surface warships or aircraft capable of carrying such a heavy munition. On the other hand, the C-802 is in use with the Pakistan Navy’s Zulfiqar-class (F-22P) frigates, Azmat-class fast attack crafts (FAC), and even the Pakistan Air Force’s (PAF) JF-17s. Moreover, there is nothing to stop the C-802 from being launched from land either. The comparatively widespread adoption of the C-802 within the Pakistan Armed Forces makes it a more suitable candidate for local production than the C-602. In any case, this is speculation on our part, it still has not been confirmed whether the Zarb is being locally produced (under license or otherwise). Azmat-class fast attack crafts (FAC), C-602, China Aerospace Science and Industry Corporation (CASIC), heavy AShM capable of delivering a 300kg warhead. Pakistan Navy’s Zulfiqar-class (F-22P) frigates, Pakistan Air Force’s (PAF) JF-17s. Moreover, there is nothing to stop the C-802 from being launched from land either.